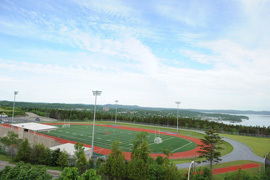 UNB Saint John boasts one of the finest track and field facilities in the country. A legacy of the 1985 Jeux Canada Games, the Stadium has a 400-metre, eight-lane all weather running track and a natural grass infield. There is fixed seating for 5,000; a press box, and other auxiliary facilities. Operations and Maintenance is located in the Facilities Management building. The Power Plant building houses the Central Heating Plant. Saint John College welcomes international students who wish to gain competency in using English for academic purposes. The Saint John College programs are designed for students whose levels of English range from beginner to advanced, and all courses focus on preparing students to take university courses taught in English. Student Health Centre houses the Student Health Centre. This building houses research offices. 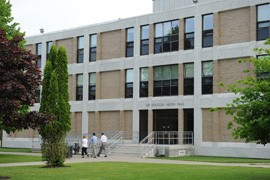 The Science building, William Ganong Hall, is named after William Francis Ganong (1864-1941), a graduate of UNB, long-time faculty member at Smith College and a former president of the Botanical Society of America. The four-storey building is designed to provide facilities for Biology, Chemistry, Geology and Physics. 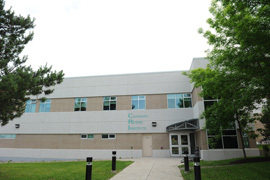 Ganong Hall houses the largest lecture theatre on the campus, a micro-lab, a spacious display area, student laboratories, and facilities of a more specialized nature, such as a large greenhouse, a controlled environment room and research laboratories. The Gallery, houses the Ganong Hall Gallery and the Ganong Hall Lecture Theatre. K.C. 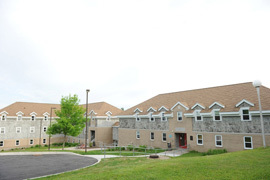 Irving Hall opened in January, 1999. 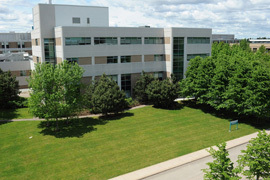 The building is named for Kenneth Colin Irving, founder of the renowned Irving empire of companies, in recognition of his and his family's significant contribution to the economy of New Brunswick and to the lives, culture and education of New Brunswickers. The Irvings have not only provided generous support to the university, but have also continually supported innumerable community groups and initiatives. 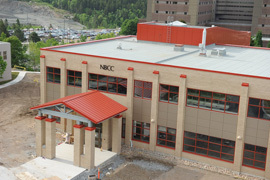 Opened in 1992, the building was named for one of UNB's staunchest supporters. 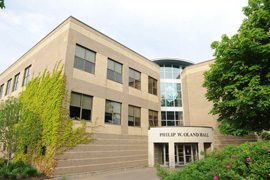 A loyal alumnus (BSc 1930, DLitt 1978), Philip W. Oland (1910-1996) was chairperson and CEO of Moosehead Breweries Ltd. Dr. Oland dedicated a lifetime of service to his country and his community. He served in the Canadian Armed Forces during World War II, was the founder of the New Brunswick Youth Orchestra, and sat on numerous boards and committees for such organizations as the United Way, the YM/YWCA, the University of New Brunswick and St. Thomas University. The Ward Chipman Library, one of the three original buildings on campus, is named in honour of Ward Chipman (1754-1824), a Massachusetts Loyalist who was deputy muster-master general to the British forces during the American Revolution; thereafter, he settled in Saint John where he culminated a distinguished legal career in being named to the New Brunswick Supreme Court. Sir Douglas Hazen Hall is named for Sir Douglas Hazen (1860-1937), a prominent former premier, member of the federal cabinet and Chief Justice of the province. 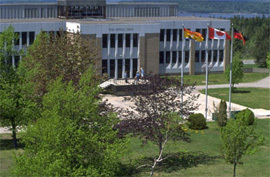 Hazen Hall houses the offices of all departments in the Faculty of Arts, the campus computing centre, classrooms and a 240-seat lecture theatre. 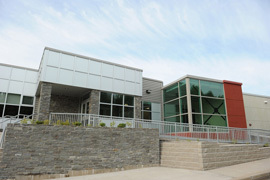 UNBSJ's Athletics Centre features a 30,000 square foot (2,949 square metre) surface with an all purpose synthetic floor. The Athletics Centre includes space for four basketball courts, four tennis courts, four volleyball courts, six badminton courts and a four-lane running track. The ground floor includes locker and shower rooms, equipment storage, a trainer's room and an officials' room. Upstairs, in addition to a suite of offices and a reception area, is a classroom, a lounge, a games room, and a conditioning room that includes fitness and strength-training equipment. 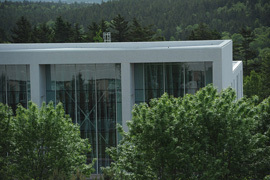 The Centre bears the name of the founding principal and first Vice-President of UNB Saint John. It was the dynamic leadership of G. Forbes Elliot and his awareness of the needs of both the young undergraduate and the part-time mature student which launched the campus on a successful start and set the pattern for the future. 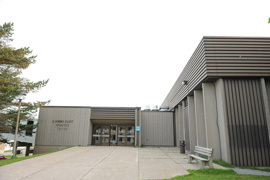 UNBSJ's Student Centre, located adjacent to the Athletics Centre, is interconnected to the other buildings on campus by an overhead walkway and an underground tunnel. 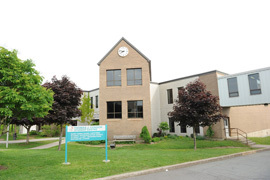 The centre houses the cafeteria, Student Representative Council office, OPTAMUS (The Organization of Part-Time and Mature Students), a social club and lounge. The building was named in honour of former Vice-President (Saint John) Thomas J. Condon. 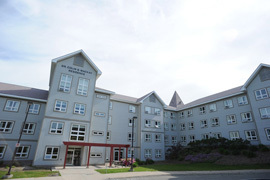 UNBSJ offers co-educational residence facilities for about 71 students in the modern Sir James Dunn Residence. Comprised of 57 single rooms, 7 double rooms and 3 two-bedroom apartments, the residence is located adjacent to the Thomas J. Condon Student Centre. Two of the rooms are specially equipped to accommodate physically challenged occupants. The complex also includes various lounge/meeting/study areas, two laundry rooms and a vending machine area. Dining Facilities for residents are provided in the Baird Dining Room of the Student Centre. 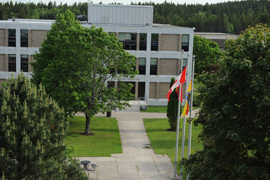 UNBSJ's newest residence opened in 2003. It was designed with input from our own students and offers 173 beds in the form of spacious double suites. Suites include two single bedrooms, kitchenettes, complete with microwave and fridge and private three-piece bath. Each room is furnished with a bed, wardrobe and desk set and standard house amenities include furnished TV rooms and study lounges, high-speed internet connection and laundry facilities. The new residence is non-smoking, co-ed and security locked. The Hans W. Klohn Commons Building, with its innovative and modern design, stands as a testament to the accomplishments of Hans W. Klohn and brings a new energy to UNB's Saint John campus. As part of the Tucker Park enhancement project, the Commons building will become the essential gathering place for a bustling campus.